Do you review your business regularly? Whatever your starting point today, you are where you are. It doesn’t matter what’s gone before. It doesn’t matter that that promotion worked, but the one that cost you loads in time and effort flopped. What’s important is that you learn from reviewing your business regularly. …is to look at everything through the clear eyes. I know you love everything about your business. And you spent months on ‘that’ particular part of your business. But really, as you review, have an open mind and open heart to look, see and listen. So, “what do I review?”, I have clients saying. OK, it’s not flippant, but you do need to review everything in your business. Not every week, or month, but regularly. Review your business financials – are they what you were expecting at this time? Have you had more income in one area of your business that was unexpected, over the budget or plan you’d written? Review your customer service – whether you’re a one wo/man band, or have a staff team, what are the customer service issues that have come up. Is it a process issue that needs fixing, or a communication one? Is there something that’s not working quite right? Review your products and services – are they meeting your customer requirements? Are they profitable (or will be profitable once you hit x sales)? Are they what your customers are asking for? Is there something you’re being asked for that you could provide? Review your website – is your website working correctly? Do you have any errors showing on your webmaster console? Are you going to fix them, or do you have a web support person who does this for you? When was the last time you added content to your website? Are all your products and services up to date & still available? Are there any old products still listed which need removing? Review your staff / team – is everyone doing what you want them to do? To the standard you require? Are they value for money & adding value to your business? When was the last time you spent time with each team member to review your business goals and where they fit into that in your strategy? Well that’s very much down to you and your business. We know you’ve got enough on your plate with ensuring all areas of the business are running smoothly. However, reviewing should be part of your business cycle that’s a standard part of at least your monthly schedule. Some areas will only need a quarterly or half yearly review, but others you’ll want to spend more time on. For example, if you’re spending money on online advertising or social media support, you’ll want to know that this is bringing you the return you want. All our businesses are different, so we’ll all have different priorities for review. We’ll all have different systems, but that’s fine. It has to work for us and our business. 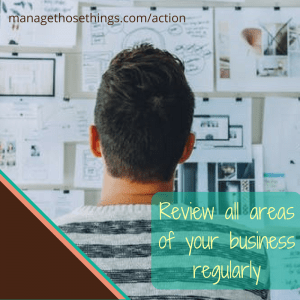 Have we missed any areas for reviewing in your business? Please let us know in the comments below. If you need help with your own business review, let us help you get clear. 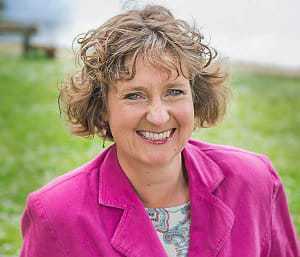 Book some time with Tracey-Jane & let’s get reviewing.